My sister asked me what I made for dinner the other night. When I told her she was shocked. She said your bathrooms must be dirty because there is no way you could have time to cook a meal like that. My bathrooms are far from spotless but they don’t look like a gas station bathroom either. My secret is the grill. I have always loved grilling especially in the spring weather. But winter or summer you will see me standing over my Charbroil gas grill. I adore the taste of anything and everything with a little char. Plus I love the cleanup. Next to nothing. My kind of meal! 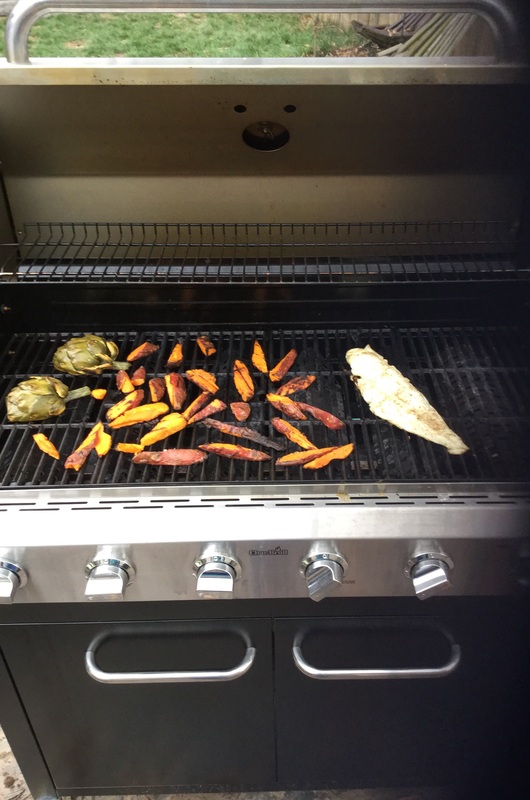 This week I made a healthy and scrumptious menu of Grilled Haddock with Grilled Sweet Potato Fries and Artichokes. Is your mouth watering? Mine is! The meal was very simple to make too. This is what gourmet is all about. To prepare this meal start by slicing your organic sweet potatoes and artichokes in half and par boil them (15-20 minutes depending on their size). They should be soft but not mushy. Grab your haddock (with skin) and salt and pepper it. Then go preheat that glorious invention, the Charbroil grill. Take your sweet potatoes and artichokes out of the boiling water. Slice the sweet potatoes into large fries. Place them on a tray with your artichokes and drizzle the group with olive oil and salt and pepper. Shazam your grill is preheated! Now, if your grill allows for three heat settings the following will be a breeze. Throw the chokes heart side down on high heat and put the sweet potatoes next to them on a medium heat. After about 7 minutes throw on the fish, skin side down on the other side of your Charbroil grill on low heat. Hopefully you have a Charbroil grill as big as mine so this part is easy:) No crowding! About 7 more minutes you will have a complete gourmet healthy meal. Spritz your artichokes and haddock with a lovely lemon wedge and plate it up. For a little more indulgence melt a few pats of butter in a small dish for dipping those succulent leaves. Or throw together a little honey, mustard and mayo for a tangy honey mustard dipping sauce for those sweet potato fries. I wish there were leftovers! The fish was moist and melted in my mouth. The artichokes made me feel like I was dining at a fancy restaurant. And how could I forget those sweet potatoes? They were so sweet that this girl didn’t need desert. Grilling food is the perfect way to infuse flavor without the calories or the work! Hmm… What to grill tonight? I feel the same way you do about my grill! There is just something about the taste of any food cooked on a grill! I really enjoyed reading this post. You’ve made me hungry! That sounds sooo yummy! I have never had sweet potato fries I need this recipe! I enjoy grilling and with a bread warmer and a built-in burner, I can do the whole meal without heating up the house or making a mess of the kitchen. I like using the grill and with an extra burner and a bread warmer I can cook without heating up or making a mess out of the kitchen.